Today I want to write about one of the most spectacular looking little birds in the world, the vermilion flycatcher. These beautiful birds only grow to about 14 cm long. They get their name from the bright red plumage of the males. The females are much duller, with brown, grey and black feathers. Vermilion flycatchers are excellent flyers, which helps them to catch a wide range of insects, including flies, butterflies, grasshoppers, beetles, termites, wasps and bees. At breeding time, the males puff out their feathers to make themselves look more impressive and perform spectacular display flights whilst singing courtship songs. The female lays 2-4 eggs, which she incubates and they both help to feed the chicks, which are able to leave the nest when they are only about two weeks old. They can raise two broods per year. 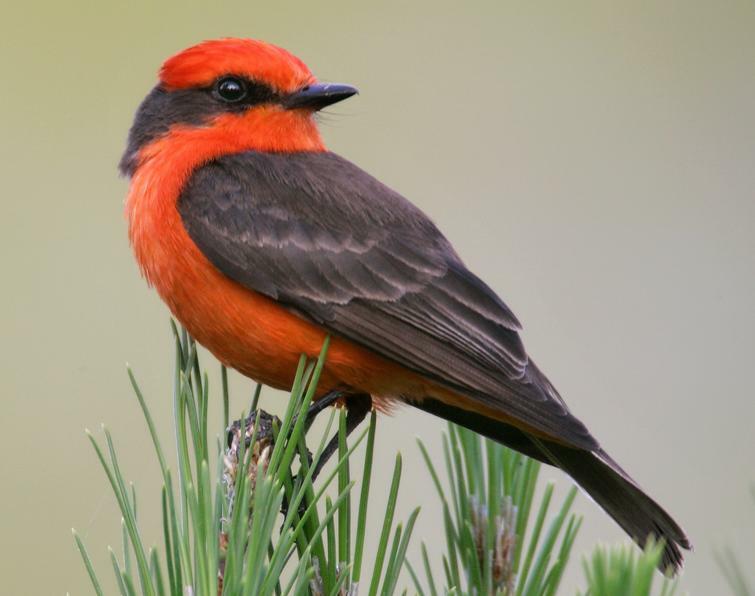 There are 12 recognised sub-species of Vermillion flycatchers and they are found in the south-western United States and throughout Central and South America, including the Galapagos Islands. Are there any other interesting facts that you would like to share about vermilion flycatchers?